Simple, Affordable, Standards-Based Videoconferencing for Everyone! 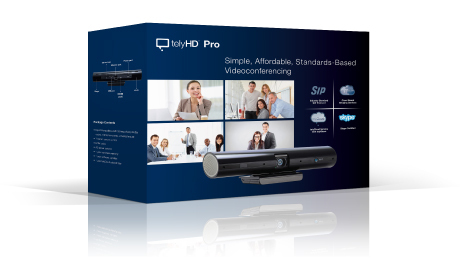 telyHD Pro is a revolutionary videoconferencing appliance that connects with standards-based systems and infrastructure at unprecedented value. And for businesses who don’t want to invest in their own video infrastructure, the telyHD Pro comes with a one-year subscription to the Tely Labs telyCloud service, providing multi-party videoconferencing with many features normally only available with a heavy investment in video networking equipment. Session Initiation Protocol provides seamless interoperability with standards-based videoconferencing systems. Built-in standards support protects an organization’s investment in capital equipment by extending the benefits of video communications and collaboration throughout an organization. telyHD Pro comes with a one year subscription to telyCloud, a cloud-based service that provides videoconferencing features without the need for any on-premise equipment besides a telyHD Pro appliance at each endpoint. telyCloud offers unbeatable value for organizations who want the benefits of business videoconferencing, including features like firewall/NAT traversal and AES encryption, but don’t want to invest in their own video servers, bridges and infrastructure. telyHD Pro includes built-in support for Blue Jeans Network using the simple, on-screen interface, adding affordable, room-based video communications and collaboration to the Blue Jeans Network. The telyHD Pro appliance also includes built-in high-definition Skype video calling for easy point-to-point connections to any Skype enabled device including smartphones, tablets and laptops. Wireless projector – the included telyShare App enables wireless projection from a Windows PC to any telyHD Pro-connected HDTV for in-room presentations, eliminating the need for bulky and expensive LCD projectors. Speakerphone – telyHD Pro has 4 noise-cancelling microphones, specifically designed for small conference rooms, eliminating the need for a separate speakerphone for audio conferencing. For larger rooms, the telyHD Audio Pod is recommended. No PC required – telyHD Pro is a self-contained appliance. No personal computer or other device is required for use. Just plug in to your Ethernet network and any standard TV to get started. Smartphone Remote Control – in addition to the included remote control device, the Smart Remote App makes it easy to wirelessly control your telyHD Pro from your Android or iOS smartphone or tablet. Scroll through contacts, enter text with the on-screen keyboard or browse the web using the telyHD Pro’s built-in web browser. Built-in Web Browser – browse the web on your conference room TV. Use the SmartRemote App to navigate with its on-screen touchpad and complete online forms with its on-screen keyboard.